I told you guys a I sewed a thing this past fall. And I really really did. Pattern is The Schoolhouse Tunic from Sew Liberated, fabric is some of the lovely gray-on-gray stripe brushed cotton from Moda’s Dapper Luke collection (that I got from the shop, of course). 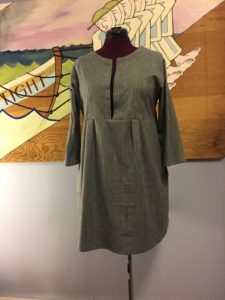 I cut a straight 12, like I did with my last SL pattern, the Clara Dress. The only change I made was to add inseam pockets (I used the pattern pieces from Clara to do it, and the instructions to do it). I love this thing. It’s a perfect proper tunic-length, perfect to wear over leggings (or jeans, if I’m feeling early 2000’s-tacular). It’s comfy. IT’S GOT POCKETS. And it’s one of those wonderful pieces that involves very little getting-dressed effort for a high I-look-put-together payoff. It’s taken me so freaking long to blog about it because while the weather for it was around, I was wearing it about once a week. I have grand plans to make a few more, possibly from the beautiful waxed-cotton chintenge our friend Jesse brought me back from his trip to Africa. So keep your eyes peeled for a new iteration… Perhaps coming next fall! Quite nice–& always the pockets! Really practical along with being “to go up town” dress so proud of you!